TECHT's Hush Pro Series Bolt for the Planet Eclipse Ego and Etek marker series utilizes our "Even-Flow" venturi face technology. This "Even-Flow" face allows the Hush Bolt to obtain optimal efficiency, while quieting the traditional sound signature associated with the Ego and Etek significantly. The Hush Bolt is not only quieter, it is lighter and smoother! The HUSH Bolt is made from 900 SP Series Delrin which makes it cycle smoother and has lower wear and friction properties.900 SP Series Delrin makes the Hush Bolt smoother than ever! TechT opted for this new material because it has much better wear resistance than standard delrin. This means your bolt will maintain optimal performance much longer than other bolts, and won't scratch as easily. The Hush Bolt also pushes the limits of weight reduction while not compromising the velocity limits of the stock rammer. 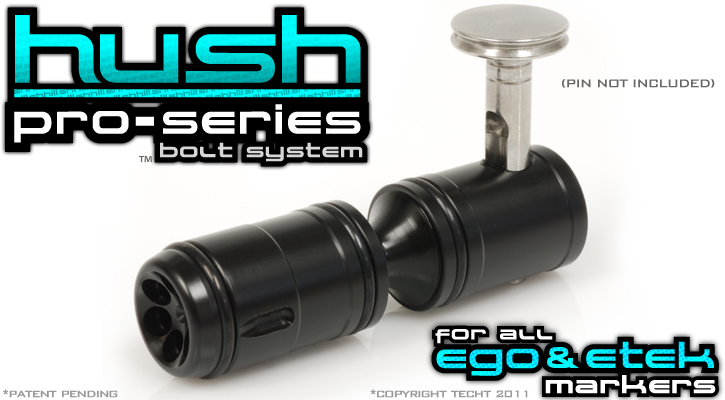 Whether you choose the Hush Pro Series Bolt or our Kush Pro Series you can rest assure that you are getting one of the best Ego bolts on the market. 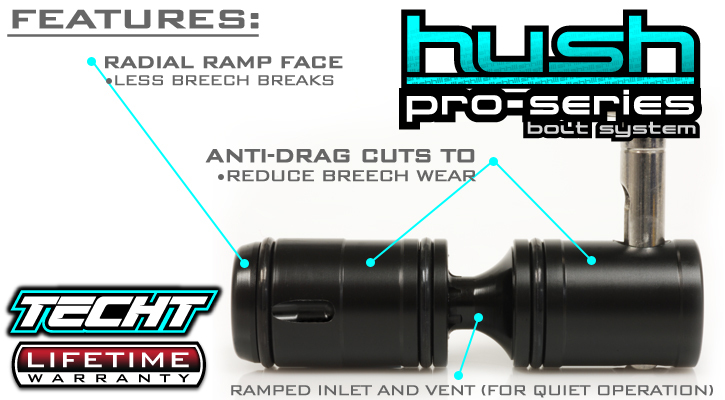 The TECHT Pro Series Hush Bolt incorporates all the benefits of the older version of the Hush Bolt but has added anti-friction cuts to minimize drag and breech wear. 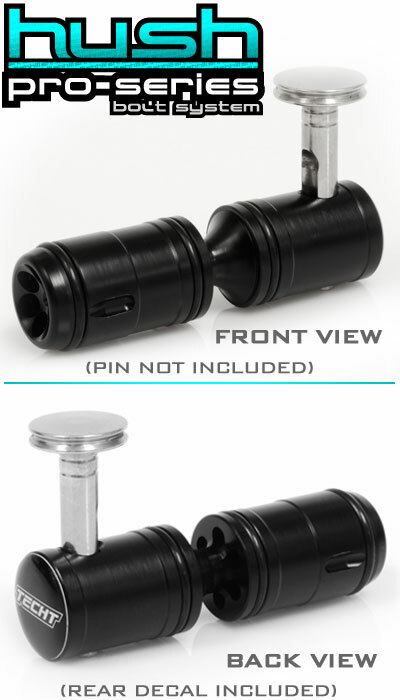 Similar bolt mods (props to Pooty) have been seen but cost additional money and time in transit, not to mention void your TECHT Lifetime Warranty. Our anti-friction cut style allows for no wasted air in the detent portion of the bolt. This means players are getting the lightest, quietest, most efficient, & friction free bolt on the market and all at the same price as older Hush Bolt designs. Other bolt features include our ramping detents grooves which make for a much easier transition for the ball detents during each shot. The detents no longer get hung up on the face orings on the bolt return. We also added the perfect angled ramp to the face of the bolt that prevents ball clipping (chopping) and also gently pushes the ball detents down on the forward bolt stroke. All in all, we designed this bolt to perfection. Quiet Operation- the Hush Bolt was designed to have a less abrupt "pop" or "crack" that has traditionally been associated with Ego Markers. 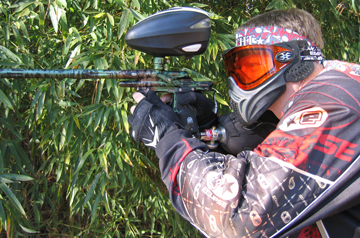 The TechT Hush Bolt has a quieter, more muffled sound signature. This means your field position is given away less, and communication on the field becomes easier than ever before. Increased Efficiency- the combination of the Even-Flow face and our unique o-ring configuration allows the Hush Bolt to seal the routing of air directly through the face. This results in less air being leaked around the bolt itself- which means far less wasted air. The Even-Flo Face also allows for extremely uniform airflow- this means tighter groupings and better accuracy. 100% 900 SP Series Delrin construction means you are getting the lightest, fastest bolt possible. The use of 900 SP Series Delrin allows for a smoother more wear resistant bolt. Radial Ramping Face- our Hush Bolt features a Radial Ramping Face which allows for less ball stack clipping, which means less broken paint in your breech. R.A.D.- Our Ramp Assisted Detent groove allows for much smoother operation, and prolongs the life of your ball detents. 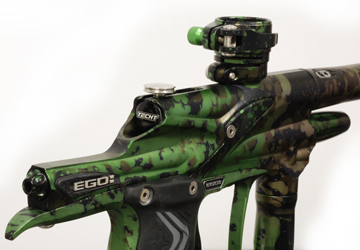 The ORIGINAL Ego and Etek HUSH Bolt Upgrade works in all older models Egos and Eteks! Complete rebuild for the TechT Ego/Etek and NEW LVL1 Hush Bolts. Comes with 3 softer orings for rebuild and 3 harder orings for rebuild.